If you asked me what the most common issue I come across when editing, it is confusion between “then” and “than.” These are words that are spelled similarly, but they are used for vastly different functions. The primary difference between “then” and “than” is that “than” is a conjunction and “then” is more often than not an adverb. “Then” is commonly misused as a coordinating conjunction, but this is an ungrammatical structure at best and a comma splice at worst. e.g. I looked at the other woman, then I sneered. In instances such as this, “then” should be preceded by a coordinating conjunction such as “and”. e.g. I looked at the other woman, and then I sneered. For more on conjunctions see our article here. “Than” serves two functions in a sentence. To express inequality and is used with comparative adjective and adverbs. My son can eat more ice cream than my husband. I’d rather be at work than the dentist. “Then” is most often used as an adverb. In its most common usage, it is used to show an order of events. “Then” is used to show what is happening or what will happen soon and to indicate what should happen next in the series. He walked to the door, pulled it open, and then stepped aside to let his parents inside. I will go to the store, buy some ice cream, and then go home and eat it. It is also used with the coordinating conjunction “but” to qualify a statement. She hoped for better, but then that never did her any good. Stop nagging me, then I’ll do it. 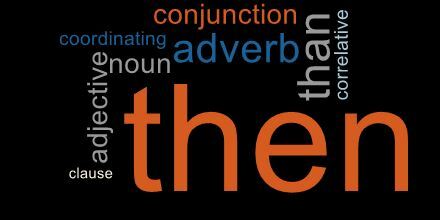 “Then” can also be used as part of a sentence showing a conditional statement. In this type of clause, “then” is used as a part of a correlative conjunction. Correlative conjunctions are used in pairs and join matching sentence parts. When using a “then clause,” the first clause starts with “if” and the second clause starts with “then”. If you want to go to that college, then you need to study hard and hope for a scholarship. Then we need to find out what happened. You know what, then? Go! Never mind. I guess you know exactly where you’re going, then, huh? The preponderance of the evidence, then, shows him to be guilty, yes? Take the first right, then merge onto First Avenue. It’s going to take pretty words and then some to appease her. “Then” can also be used as a noun that means “that time” and “that moment”. The dog hated cats from then on. He would wait until then. “Then” can be used as an adjective meaning “belonging to a time mentioned”. “So then” is a final or illative coordinating conjunction that is used to relate an inference or consequence. She tripped and ripped her dress, so then she ran off the stage crying.